We warmly welcome international exchange students who want to study at our University for one or two semesters in the fields of Music, Performing Arts, Dance, Design and Academic Studies. The Folkwang University of the Arts only accepts exchange applications through the online application system EASY. Please note: Folkwang University of the Arts does not accept applications through email or regular post. Your home institution will automatically receive a request to nominate you once you have submitted your application. When you start the application process, please make sure that you have chosen the right home institution. All our partners should be listed in EASY, but if you do not find your institution, please write to boje-karaaslan(at)folkwang-uni.de. Please click here to get to the EASY application. The online application form will open 15th March (winter semester and academic year) and 15th September (for summer semester). The International Office will let you know the final decision about your acceptance as soon as possible (approx. six weeks later). We will also be glad to answer any questions concerning your application and to help you through this process. Non-EU students who wish to study in Germany need an appropriate visa for entry. Please note: entry with a tourist or visitor visa is not sufficient for study purposes! Please check the up-to-date German visa requirements for your home country. If you need a visa, please contact the German embassy or consulate in your country well ahead of time. Remember, you will need a student visa. In order to enrol at any German university you must have health insurance. You can get this once you have arrived in Germany or in your home country (see below). We recommend that you will be sufficiently insured during your travel to Germany and until you actually enrol here in Essen. We guarantee affordable student accommodation for all exchange students who are accepted for our programmes (approx. 300 Euro per month). This is offered by the Studentenwerk Essen-Duisburg. Please apply online until July 31st for the winter semester or January 31st for the summer semester. (We recommend that you select the Essen location). You won’t need to attach any other documents than a copy of your passport and your letter of acceptance. Four to five weeks after confirmation of your application you will receive your room offers. ATTENTION: Please do not forget to confirm the answer on your application by e-mail! To reserve your room, you will need to transfer a deposit of approx. 400-600 euros to the Studentenwerk; they will demand the payment of you. You will get your money back after you leave, as long as your room is left in good condition. The money will be transferred to your bank account. If you are looking for a room in a shared flat please have a look at the several homepages in the internet. You should calculate monthly living expenses including rent of 770 Euro at the moment in Germany. Our faculty administration officers will get your Folkwang ID ready for you ahead of time. Please send the required form with your passport photograph to the International Office. The Folkwang Card will be your photocopying card and your regional transport ticket. You will also receive a discount in the cafeterias in Essen universities. You will receive this card once you have enrolled (see also below). The closest airports are in Dortmund, Düsseldorf, Köln-Bonn and Frankfurt. From there you can reach Essen easily and comfortably by Deutsche Bahn. Travel time from Frankfurt Airport to Essen main station is around 2.5 hours. The airport Duesseldorf is approx. 20 minutes away from Central Station of Essen. Please have a look at our visitor’s page to find out about connections to our University. IMPORTANT! Please inform our International Office about your precise arrival date and time. Please come first to the International Office! If you have booked student accommodation, please make sure you arrive at the Studentenwerk during business hours. The Studentenwerk Essen is located on the Campus of the University of Duisburg-Essen, opposite the “Red Cafeteria” Café Rosso. 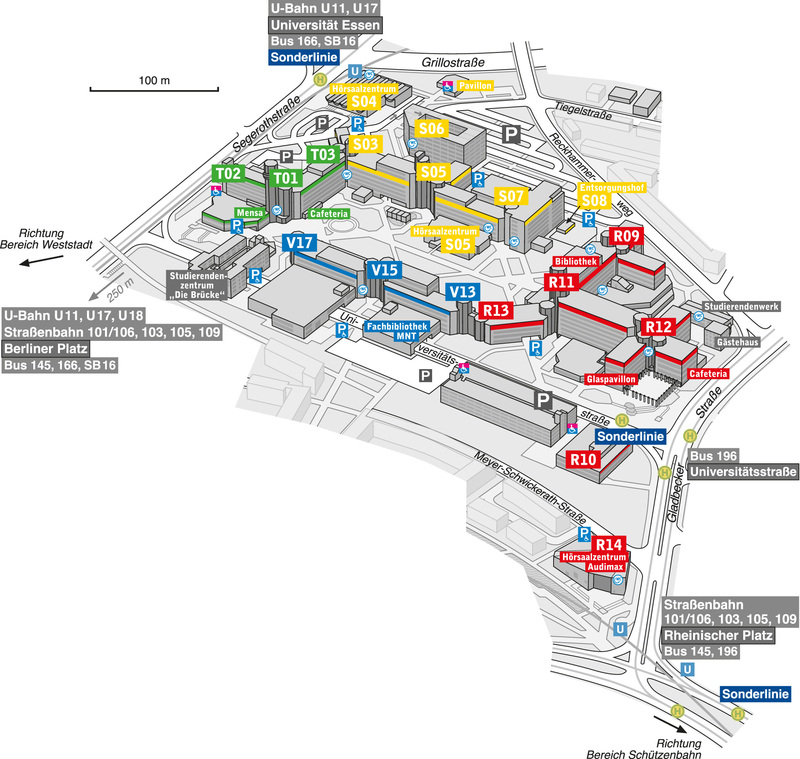 You can reach the campus by tram/underground 101, 103, 105 or 109 from the main station/Hauptbahnhof. Get off at “Rheinischer Platz”. From there it is a 5-minute walk to the campus. Please see also the campus map. Once you have signed your contract in the office of the Studentenwerk, you will have to go to the student residence/Studentenwohnheim. The caretaker/Hausmeister will hand over your key. Then you can make yourself comfortable in your new room! In order to enrol at a university in Germany, you must have health insurance. You can either take out student insurance at a German Krankenkasse (health insurance provider), or alternatively, an international insurance. Student insurance in Germany costs approx. 80 Euros a month. If you possess an international insurance, please present it to the Krankenkasse. You will receive a certificate, which you require for enrolment (this certificate is an exemption from the compulsory insurance, stating that you can no longer receive a statutory health insurance in Germany as a student). If your German is not sufficient you must bring a translator (your mentor) with you. You won’t be able to do these things using English. How do I get here? – The Bürgeramt is situated just 5 minutes’ walk from Essen main station. Students who hold temporary visas must complete the visa requirements at the Foreigners’ Registration Office. It is your responsibility to make sure you are up-to-date with current visa regulations. After your arrival you should open a German bank account. You can do this at any German bank. This service is free of charge for students. You will have to present your residency registration (your invitation letter might be temporarily accepted) and your passport. The bank account will be necessary for depositing your housing deposit and monthly rent. During your stay at Folkwang you might consider a language tandem with one of your fellow students. This means improving your German and teaching your language partner your own language. Registration form here. You can take advantage of the sports programmes for students at the University of Duisburg-Essen. Please see the respective website for details (in German only). As a Folkwang student you are welcome to attend the yearly 300 Folkwang performances for free. Tickets are available and to be reserved by presentation of your Folkwang Card. The International Office welcomes you to Folkwang University of the Arts. We will be happy to help you with any academic or organisational matters during your stay in Essen. Please collect all certificates and proof of course participation, and present them to the International Office or Examination Office so that you will receive a Transcript of Records. Design students, please return your magnetic cards and keys. The caretaker at your student residence must be informed of the precise time when you will move out. Please make sure to return your key. You will also need to cancel any contracts you may have (mobile phone, cable-TV etc.) ahead of time. Your deposit for your student residence will be transferred back to your bank account after you have left your room. We would appreciate your feedback on your time at Folkwang and hope you had a brilliant time.